See also http://dolomiti.pha.jhu.edu/uvsky for additional user tools and documentation. Coverage map of the BCS catalog in Galactic coordinates. Blue are AIS tiles, green MIS tiles, and black are from other surveys (DIS, GII, etc., but are not included in the BCS catalog). Taken from Bianchi, Conti & Shiao 2014, AdSpR, 53, 900. The GALEX spacecraft operated for over 10 years and surveyed nearly the entire sky during its lifetime. The telescope observed in both FUV (1344-1786 Å) and NUV (1771-2831 Å) simultaneously until May 2009, when the FUV detector failed. 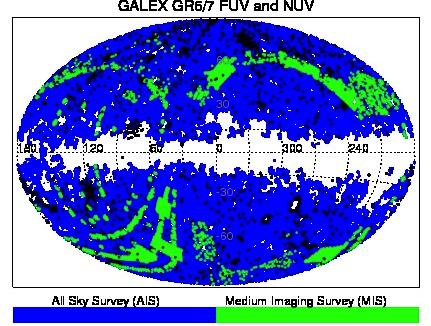 The NUV detector continued to operate until June 2013, when GALEX was retired and the mission ended. The standard GALEX data products at MAST include visit and coadd image files, as well as a source catalog produced by the GALEX reduction pipeline called the "MCAT". The MCAT consists of over 200 million source measurements, but, since it was run on each tile, there are multiple measurements of the same source due to tile overlaps and different surveys (AIS, MIS, DIS, Guest Investigator, etc.) To rectify the situation, Bianchi et al. have constructed a catalog of unique sources: one based on All-Sky Imaging Survey (AIS) tiles, and another based on Medium-Sky Imaging Survey (MIS) tiles. These catalogs (BCS AIS and BCS MIS, respectively) are homogeneous in depth and quality, and are optimal for cross-matching GALEX UV fluxes with data in other bands (e.g., for source selection combining optical or IR data), or for Galactic and extragalactic population studies. Cross-matches of the BCS catalogs with the Guide Star Catalog II, SDSS, and PanSTARRS surveys will be made available at MAST in the near future. Please use the links below to find additional information on the creation of the catalogs, the available data products, how to access the data, and powerful ways to interact with the catalogs on our CasJobs website. Visit this page to learn about the creation of the source catalogs, including source selection and the set of tiles that are used in each catalog. Visit this page for a table of catalog columns and their descriptions. Visit this page to learn how to interact with the catalogs though MAST's CasJobs pages using powerful SQL queries. Visit Luciana Bianchi's homepage for user tools, supplemental data products, and more information.